We have tickets this week to 3 Juilliard Performances: Juilliard Jazz, Juilliard Orchestra with Itzhak Perlman conducting, and Juilliard Drama performing Sondheim's musical "Into the Woods." Our oldest grandson joined us for the Jazz concert, and two of our youngest grandchildren will go with us to see Into the Woods. These concerts are very reasonably priced and one of our favorite activities in NYC. 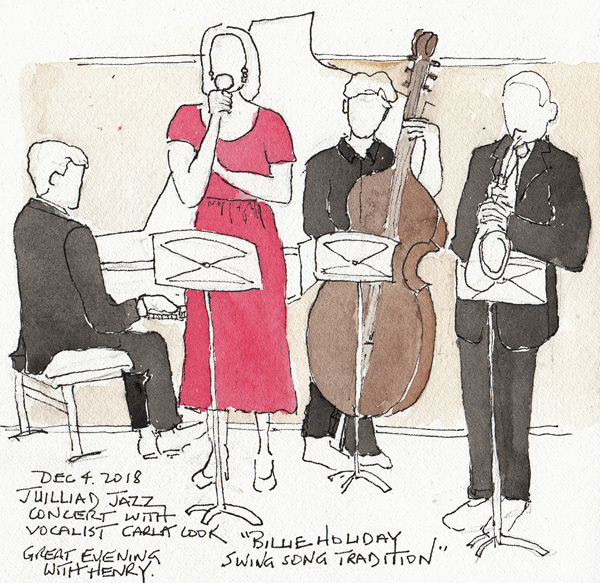 Juilliard Jazz with vocalist Carla Cook, a very experienced vocalist who sang "Billie Holiday Songs in a Swing Tradition": She practiced with the musicians for a week and couldn't have complimented them more. I managed to sketch 4 of the 6 on-stage performers in the first half of the concert. 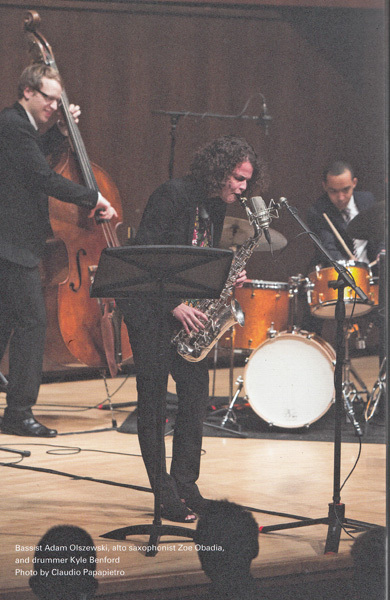 Photo of Juliett Jazz musicians from the concert program. There were different musicians for the second half of the concert. I wanted to include this photo because Zoe Obadia, who is pictured here, is one of our favorites. We actually wondered if we would see her this season, or would she have completed her degree program. Last night we went back to Juilliard to watch Itzhak Perlman conduct the Juilliard Orchestra in a Dvorak Cello Concerto and Elgar's Enigma Variations. We were sitting in Row M Center, so I didn't bring my sketchbook. But then I found out Row M was 6 rows from the stage and I did have a pen and one of my small sheets of copy paper. After seeing the documentary "Itzhak" this summer I can't get enough of this giant of music. 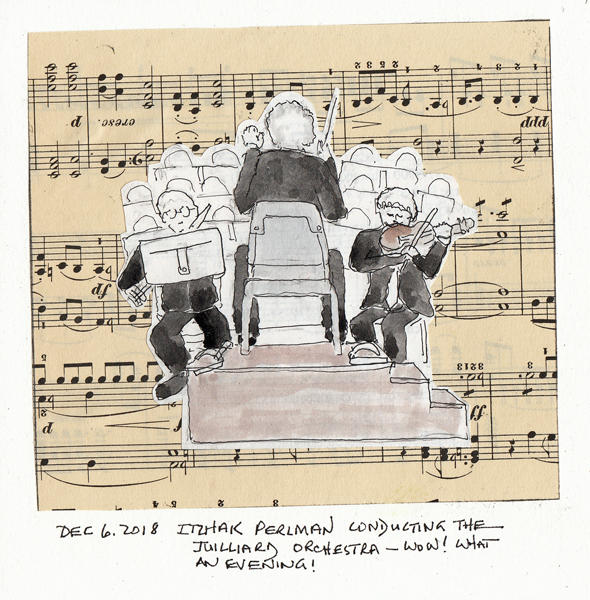 I wanted some sketchbook documentation that I saw him again - the first time was in a rehearsal of him playing a violin concerto with the NY Philharmonic. 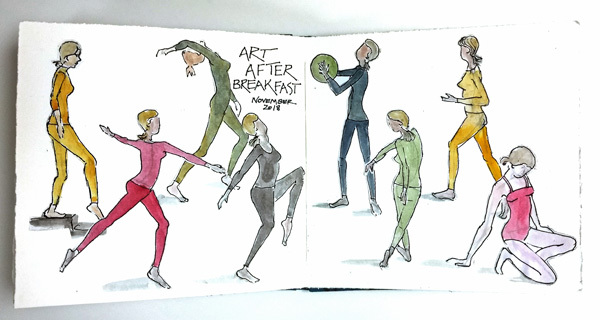 Danny Gregory wrote a book called Art Before Breakfast. 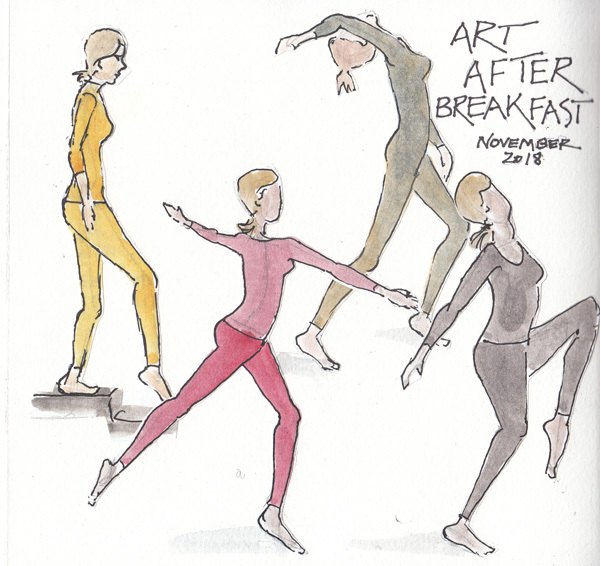 My brain doesn't function until I have coffee, and when I had a wrist fracture last spring I seriously started drawing figures after breakfast. Each of these figures is drawn on the back of scrap copy paper, torn into quarters (5.5"high X 4.25"wide). I leave a pencil, black gel pen, and an art book of photos with people in action on my counter top. When I accumulate some drawings I cut them out and collage them in my sketchbook. This practice keeps me drawing even when I don't have more time for other art projects. Left Page Scanned: Visible pencil lines on the figures are my lines of action. I use them to direct my pen drawings of the actual figures. There are many art auction houses in New York City, but Christies and Sothebys are the big ones. 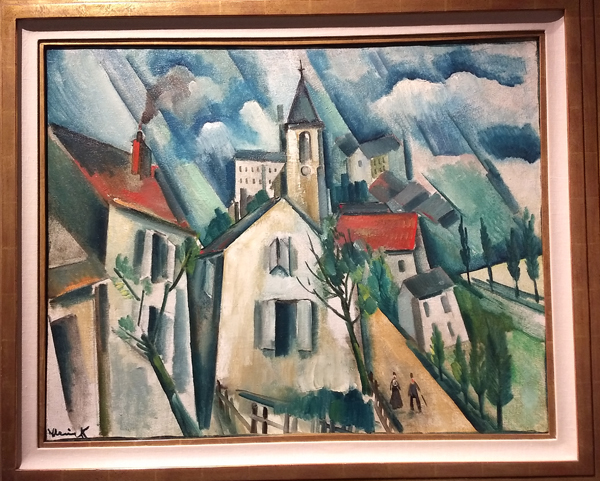 Twice each year I go to the previews for their Impressionist - Modern - Post War - and Contemporary Auctions. 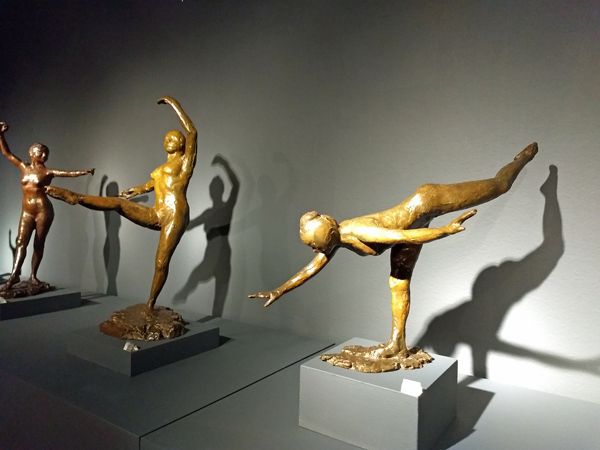 It is an opportunity to see many paintings, drawings, and sculptures that are only seen as they move through the secondary art market. They have auctions in many other major cities in the world, and if you live near one I encourage you to search their websites and go to a preview. 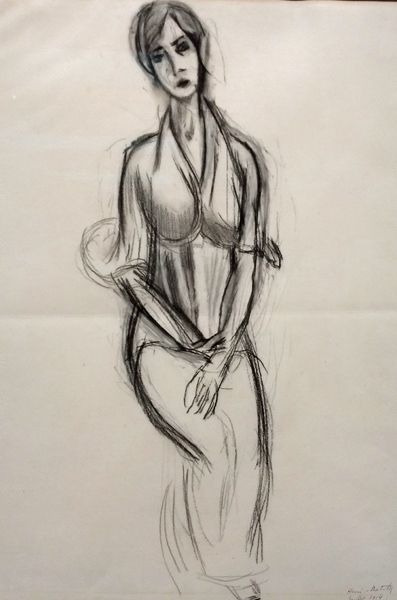 I usually walk through all of the galleries, just enjoying lesser known works and then select a favorite to draw. They all need to be painted at home. 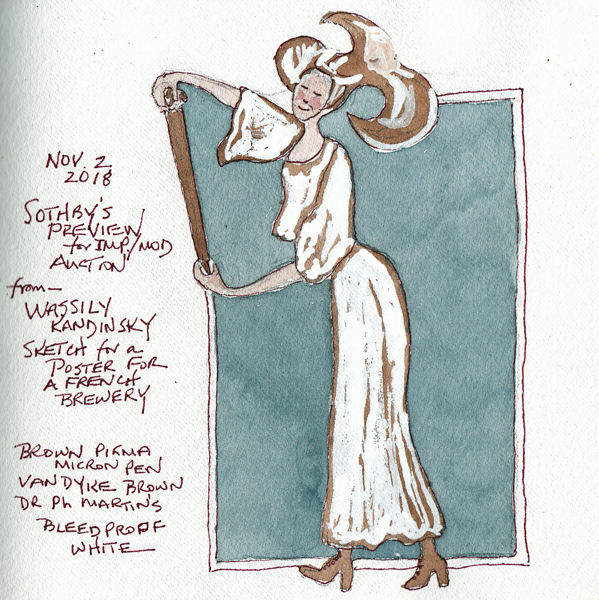 At Sothebys I saw this painting for a French Brewery Poster by Wassily Kandinsky. I not only loved the image, but also wondered how I would paint the white over brown. While in London I bought Dr Ph Martins Bleed Proof White and that was how I did it. 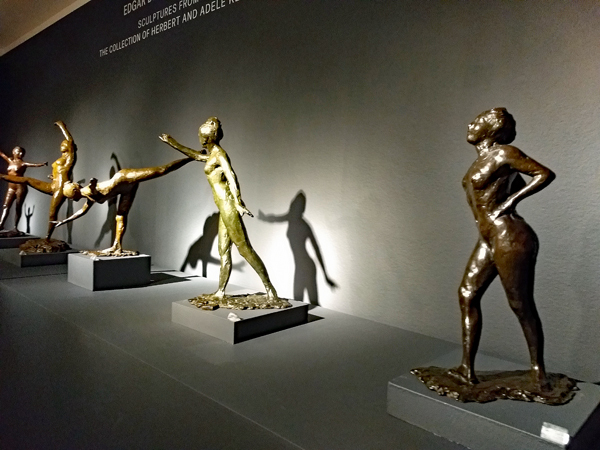 The following weekend I went to the previews at Christies and there were 5 of my favorite Degas Sculptures. 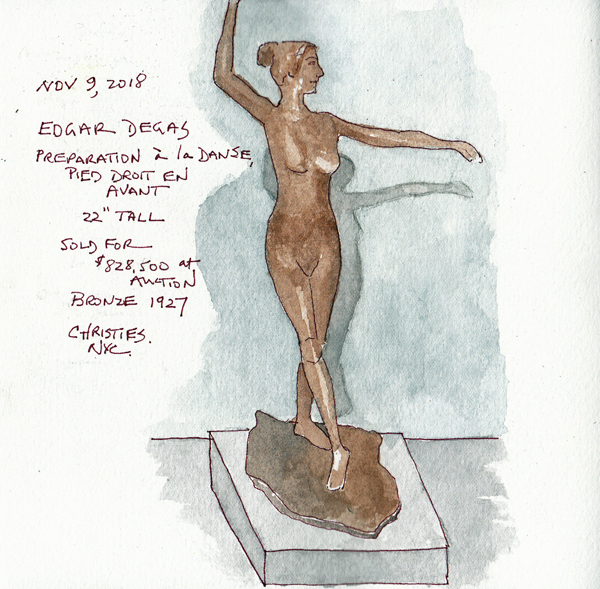 I sketched and painted one and tried to photograph all 5 from this private collection. She is 22 inches high, and sold at auction for $825,000! Here are two photographs that I was able to take quickly when there weren't people standing in front of them. And these were the 3 at the far end of the 5 in the photo above. 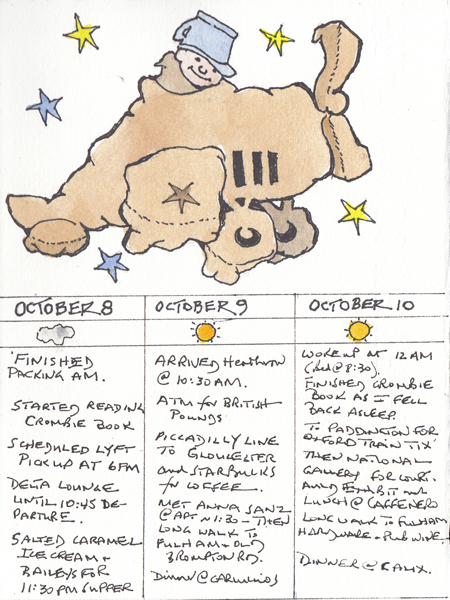 I still have ephemera and a few photos to add to my London Travel Sketchbook. But I decided to end my blog entries from our trip with two other types of pages that I usually include. 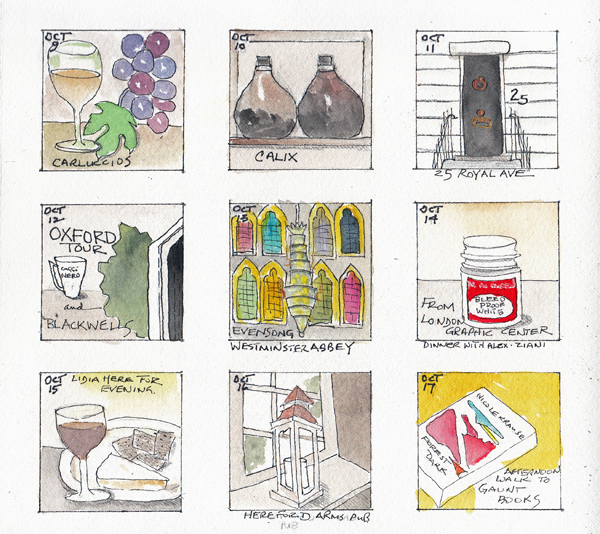 Two X Two inch Grid: I regularly set up one or two pages to create a set of very quick paintings of something that I liked for each day. Several of these are from restaurants during dinner, others are from locations we visited, and two are from purchases I made. The terrace house door was from the place we stayed with our daughter and her family in 2006-7, and we enjoyed walking down the street past the house to relive those wonderful memories with our family. Some Daily Notes: I added a chart to write some notes for each day of our trip, and also added icons for the weather. This is one of the three pages as an example. Inspiration: I collaged this illustration from Gourmet magazine to the last page of the sketchbook. It is from many years ago, and I decided to add it as an example of a wonderful painting of a place. My husband and I went to Europe for the first time in January 1970, spending a full 2 weeks exploring the City and the theater scene. Piccadilly Circus was so memorable to me that I saved this for almost 20 years until I refound it and made it part of our visit this year. 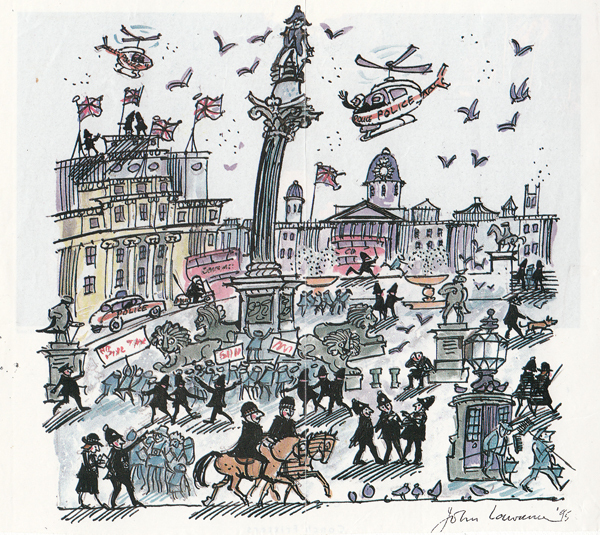 The artist's signature says John Lawrence 1995, and I just learned that he is an English Illustrator born in 1933. I am still practicing drawing figures in action from photographs. These are my "art after breakfast" drawings, first started during my 6 weeks with a fractured wrist on my domiant hand, and now done because they are a very quick way for me to draw something almost everyday as I am finishing my coffee. My grandchildrens' summer camp posts 100s of photos every day and these were ones I sketched. Each one was sketched on a quarter sheet of scrap copy paper. I selected these poses from those I sketched and collaged them to a sketchbook page. The one with the sunglasses is my 15 year old grandson Henry. I then remembered that I had a book entitled The Human Form in Action and Repose by Phil Brodatz and Dori Watson (1966). The next two sketchbook pages are collages of drawings from those photos. The pencil lines are my quick gesture line, and then I draw the figures in ink. 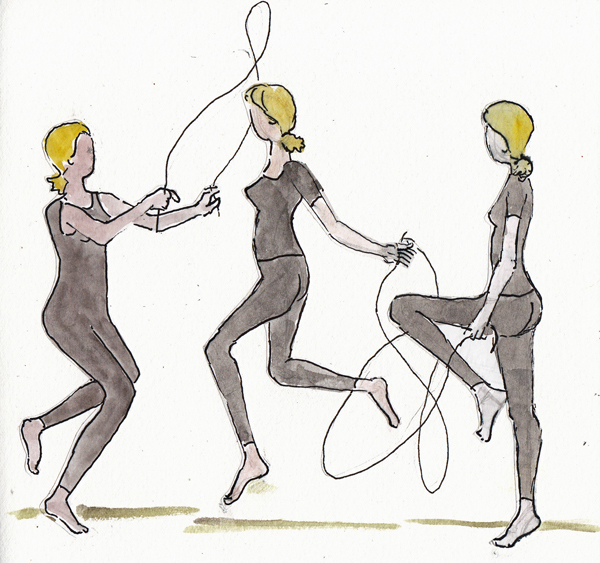 I loved the figure photographed in multiple rapid action shots while jumping rope. I'm busy cooking for 19 for Thanksgiving, and was happy that I had this blog post waiting for such a busy week. HAPPY THANKSGIVING TO ALL WHO CELEBRATE OUR AMERICAN HOLIDAY!